Vibro Motor click features a compact size Eccentric Rotating Mass (ERM) motor, labeled as C1026B002F. This type of motor is often used for haptic feedback on many small handheld devices, such as the cellphones, pagers, RFID scanners and similar devices. This motor contains a small eccentric weight on its rotor, so while rotating it also produces vibration effect. This kind of motors is sometimes referred to as coin motors, due to its shape. Besides the vibration motor, the click is also equipped with the DMG3420U, a small MOSFET, which is used to drive the motor. 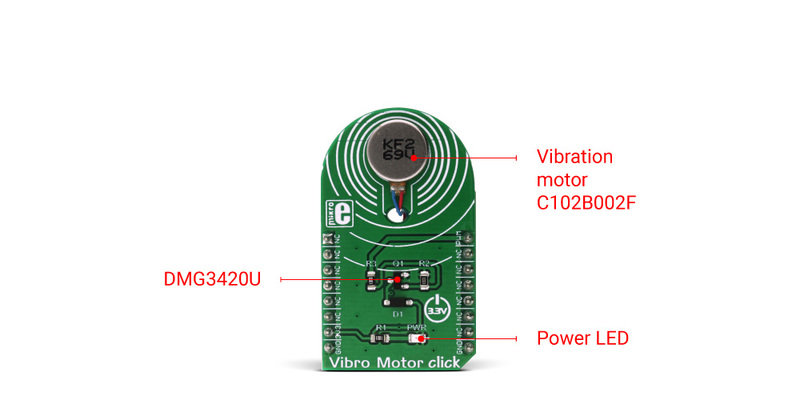 The Vibro Motor click is an ideal solution for adding a simple, one pin driven haptic feedback on any design. The click uses the DMG3420U MOSFET to drive the ERM motor, since the MCU itself cannot provide enough power for the motor driving. The circuit also contains a protection diode, which is used to protect the transistor from the reverse voltage, since the motor represents an inductive load and turning off its current can produce a kickback voltage that can damage the transistor. The gate of the MOSFET is driven by the PWM signal, routed through the PWM pin of the mikroBUS™. The PWM signal toggles the gate of the MOSFET with the pulses of a certain width. As a result, the current through the motor is varied depending on the pulse width of the PWM signal, which directly affects the speed of the motor, effectively controlling the vibration force that way. The small, eccentric weight attached to the rotor of the coin motor, generates the centrifugal force while it rotates, which in turn results with the wobbling effect of the motor itself. The faster the rotation is, the bigger the force gets. Controlling the motor speed allows for the vibration intensity to be controlled. MikroElektronika library contains functions that are used to easily drive the motor by changing the PWM pulse width, saving time for the application firmware development. Applications An ideal solution for adding a simple, one pin driven haptic feedback on any design.